We’ve reached the next chapter, wiring. Most of the loose ends have been sorted however there are still a few that need to be tidied up. 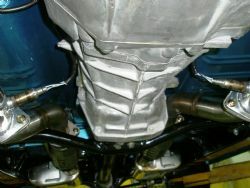 The exhaust is complete and fitted to the rear axle. 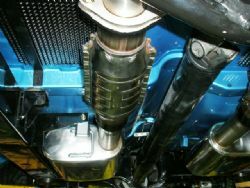 The oxygen sensors are installed, the cats have been massaged into the pipes and the exhaust now runs above the chassis line to minimise the likelihood of getting it ripped off on the mountainous speed bumps that litter Sydney’s northern beaches. 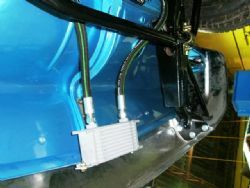 Cat shields have been installed to minimise hot spots on the floor and all the pipes have been bent to exit the rear of the car – they just need to be welded and installed once the wiring is completed. All the pipe plumbing is in place and functional. 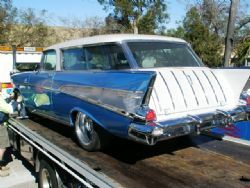 This includes new fuel lines, the clutch reservoir lines and the power steering radiator hoses. New brake lines have been run from front to rear and plumbed into the new Australian approved braided brake hoses on all four wheels. The charcoal canister is plumbed as well and the wiring harness from the tank has been consolidated and is now accessible to the auto electricians. The brakes have been reinstalled and no longer bind on the calipers and the wheels have been refitted and roll as you would expect. It is now a lot easier to move the car around and the new custom handbrake cable is installed and working perfectly. After wiring Project Nomad will need to go back to Cromer Exhaust to have the loose ends sorted which should be no more than a couple of days in the shop. The brakes will need to be bled again, the exhaust hung and the final drama, the power steering pump, fitted. Murphies law reared its ugly head again and at one minute to midnight we needed to change the angle of the hoses from the new power steering pump to allow appropriate clearance. It turned out the fittings did not have a screw thread so the pump had to be pulled and sent off to the engineer to be threaded to allow a right angled fitting for one of the hoses. This may be sorted before the wiring is complete as we need the belt on for us to fire it up. After much deliberation and the obvious delays in the project I made the decision that Project Nomad is not going to Melbourne to get wired and trimmed. After all the dramas of the last few months it will be better to have it close by so the decisions that will need to be made can be viewed, talked through and implemented in a timely fashion. So Project Nomad currently resides in Brookvale with Henshaws looking after the wiring for me. This will be a big job and so far I feel confident, based on referrals and my own time with Peter that the guys will do a top shelf professional job. More to come....watch this space.